Change, tech visionaries like to say, is good. But until it's clear whether the change will actually bring goodness or just more problems, it can be very chaotic. And when, as with Hewlett-Packard (HPQ), change involves CEO Mark Hurd's abrupt resignation, it can end up leaving pools of blood in the water for competitors to scent. Although HP's rivals have been quiet, there has to be some licking of chops in the executive suites of Silicon Valley. HP's board swatted out Hurd as CEO over reasons that are admirable from the point of view of corporate governance. But the directors made a costly error in not naming Hurd's replacement immediately. And the longer it takes to find a new leader, the more hay rivals can make at HP's expense. HP has been battling for a leading slot in PCs, servers and computing services. To Hurd's credit, part of his legacy is strong management in all of these businesses. But he also hobbled each manager by cutting costs in each business to a severe extent, simply to placate investors. Hurd slashed as much as he could without cutting into the bone: When you take 20% off employee salaries, you know you're going as deep as possible. Because HP doesn't thrive in a single market -- it merged and acquired its way into many of them -- there's not one fatal competitor who could pounce on its moment of vulnerability. But several companies are capable of grabbing chunks of its various business lines. Here's a look at HP's key segments, how competitors can capitalize on HP's weakness and what HP can do about each threat. PCs. In hindsight, if HP really wanted to give IBM (IBM) a run for the money, it should have followed Big Blue's example: buy a healthy consulting shop like PricewaterhouseCooper and then sell off a low-margin PC business to a rival like Lenovo (LNVGY). Instead, Hurd's predecessor Carly Fiorina made a failed bid for PwC and bought PC maker Compaq instead. Years later, HP's PC business continues to be a drag on earnings, delivering operating margins of 4.7% last year, compared with HP's overall operating margins of 8.8%. And this year, PCs and netbook prices are in a race to the bottom. HP faces price pressure from Chinese rivals like Lenovo, Acer and ASUS, all of whom gained market share last quarter, to a collective 28.2% from 23.7% a year ago, according to Gartner. HP's share shrink to 17.4% from 18.8% in the same period. 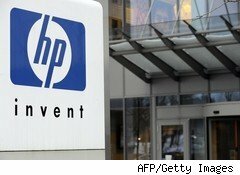 With operating margins below 5%, HP will have little ammunition to compete on price against its overseas PC rivals. Mobile. On paper, HP + Palm makes sense, considering that Palm is a highly respected mobile OS with a company that has marketing heft. Even better, since HP likes to recommend its own hardware to services and consulting clients, an HP-Palm smartphone can challenge both Research In Motion's (RIMM) BlackBerry and Apple's (AAPL) iPhone in the mobile enterprise market. And then there are reports of a Palm-driven tablet, just as there's evidence that the iPad is becoming a business tool. It all sounds good. But this is perhaps HP's most competitive market. It's one thing to launch an HP smartphone to compete against the iPhone and an HP tablet to compete against the iPad. It's another to win market share. After all, smartphones powered by Google's (GOOG) Android software are already growing more rapidly than iPhones in the U.S.. And Microsoft (MSFT) has plans for devices running on Windows Phone 7. Servers. Dell (DELL) really doesn't have an advantage against HP in PCs. Its PC market share has been shrinking for some time. If Dell wants to gain ground against HP, it will be in servers. Dell's server revenue in the second quarter rose 24% versus HP's 8.7 percent growth. But time may be on HP's side here. Dell is in the midst of its own turnaround, and it lacks the global distribution that HP has in servers. Those machines are a much higher-margin business than PCs, so HP would be smart to focus on sales growth here. Services. After HP bought EDS for $13.9 billion, apples-to-apples comparisons with IBM became harder. But HP says its enterprise business has operating margins of 14.5%, versus IBM's operating margins of 19%, which suggests cost-cutting may be needed to approach IBM's profitability. But how much further can HP cut? That presents an opening for IBM with clients. When HP bought EDS in 2008, IBM immediately launched a campaign positioning itself as the more analytical and seasoned services company. IBM has been silent this week on its rivalry with HP, but its sales pitches are sure to rely on the relative stability of its own executive suites versus the confusion inside HP -- all at lower cost. In its favor, IBM has a forward price-earnings ratio of 11 versus HP's 8, suggesting investors expect better earnings growth from IBM. The loss of HP's CEO, the uncertainty about leadership for its future and the media frenzy that has ensued since Hurd's forced resignation create instability that competitors can profit from. But only some of HP's businesses are likely to be vulnerable. IBM is in a good position to pick up consulting clients during a recession where companies crave consistency, and Asian PC makers can compete aggressively on price. But in the end, it's going to take more than Mark Hurd's resignation to return HP to the early 2000s, when mismanagement very nearly brought the company to its knees.